Fly fishing accessories, flytying materials, hooks, DVD's, lures, waders and many other stock lines less 20% off current prices. One week only. Sale runs from Monday 10th August to 3:30 pm Sun 16th of August. In store or mail order by phone and online. *Sale is on current in stock items only. Bait and some items not included in sale. Sorry no Lay buys. Headlines: Fishing has been good for some but tough for others. Some nice fish have still been caught in the lakes. Bait fishing had been the most productive from reports received. Lake Eucumbene continues to rise and is now 19.6%.. We have had a little rain today. Lets hope for more. We predicted some great fishing before last seasons sensational spring and early summer. The potential for the lake to fish as well if not better than last season is very real. We are predicting that the fishing will, if the lake gets to 27% or greater be a real eye opener. Watch this space. Lake Eucumbene:- Fly reports have been quiet but the dam wall and western shores are well worth a polaroid when conditions allow. Woolly worms, buggers, matukas and tom jones will take fish in theses areas no problems. You just have to find them. The dam wall can fish very well at this time of year on rainbows and would be a good option if there is a strong West/Sou West wind blowing. Other areas to look at are Wangrabelle, Seven Gates, Cemetary point, Wainui and Cobrabald. Lake Jindabyne:- Jindabyne has been tough for the polaroiders despite some excellent weather on the weekend. Searching with a woolly bugger will produce a few nice ones or just wander the bank looking for fish and cast a small wet or nymph at any fish found cruising. There is still a heap of weed in many of the bays that is drawing the fish in to the food that it holds. *One angler spent several hours on the lake and struggled to find fish last week. In the end he did manage a nice 2kg atlantic salmon. Lake Tantangara :- Has been worth a look with some good numbers of smaller fish being caught. Small nymphs and wets are the pick of the patterns and boat fish has been very good. Quick rundown on how we went over the weekend. Took Micks advise and tried the Eucumbene Dam Wall area, it was hard work but there were Rainbows around and we accounted for 5 up to 1.1kg. All of them were coloured up for spawning and were taken on either lures (the new Vibrax) or Powerbait. A lot of casts between fish though. We also had a brief spinning session out at Anglers Reach and all though we only got 1 Rainbow of 700g, we had plenty of hits and follows. With a bit more time I am sure we would have caught more. Jindabyne was tough though, Fridays weather was abysmal so we didnt bother out there and Saturday was too good if you can believe it. The lake was mirror calm and I hate it like that so we only spent 45 mins out there for zilch before heading over to Eucumbene. 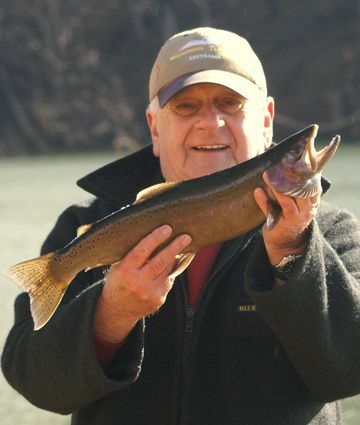 Only 1 photo, of Dad with the best Rainbow for the week, an amazingly dark fish too. Try pink tassies and yellow wing patterns flat line and on leadcore. Rapalas and RMGs around the edges early can also be deadly. Baitfishing in Eucumbene has been pretty good overall. *The dam wall produced some nice fish for one Canberra crew last week with some nice rainbows being caught. *Tom Stosic from Canberra caught nine rainbows in an over night session last week. Average size was 40-45cm. Gulp orange pulp and grubs were the best baits. Tom was in the Seven Gates area. *Johnny Scrubworm had a brief sesssion at Wangrabelle landing two nice fish on Powerbait and Scrubbies.